It all started when I stopped taking my watercolor set with me everywhere (although relatively small) since my bags are usually small & the set takes up a lot of space. Me not always using the set didn’t help either so I started looking for alternatives. Until something DRAMATICALLY better surfaces, I’ll use this as a bookmark in my journal for quick watercolor sketches. Initially, I found this. Empty mint tin-boxes, filled with watercolor & some mini tools for on-the-go purposes. I then found this video in the suggested-videos side of youtube, and I felt my existence change. This particular one is used for pastels, and I have a thing for brown/kraft paper. You can definitely use any card you know you won’t be needing any time soon, or a cover of any old book/magazine. Whatever size you choose, fold it. My favorite is from Amos only because it has two tips (fine & wide), but any good glue would work. These have been magical & the reason I got into watercolor. They come in several tips, and are a joy to work with. They’re very portable too, because you fill them with water & carry them around in your bag/pocket. They’re a bit difficult to find here (UAE), but Kinokuniya in Dubai Mall has them as part of the Sakura’s Field Sketch Kits (which are an excellent investment). These used to be difficult to find, but are pretty much available in all bookstores now. They’re the best pens to work with any medium that contains water. Any watercolor paper would do. You’ll need two sides, and I basically cut them based on the card stock I’m using. I’ve had some washi tape for a really long time, from this cute stationary store in Deerfields Mall. Pretty sure you can find it cheaper online. Any daiso branch has some of them too. I used this to bind the laminating film (pre-lamination), so that the wet-watercolors side, doesn’t mess up the neat-swatch side. I did a little research on these cuties, and found out that they’ve existing since the 1800s and were used to tint photographs. What I never understood is how they’re not the only thing being sold in the market? 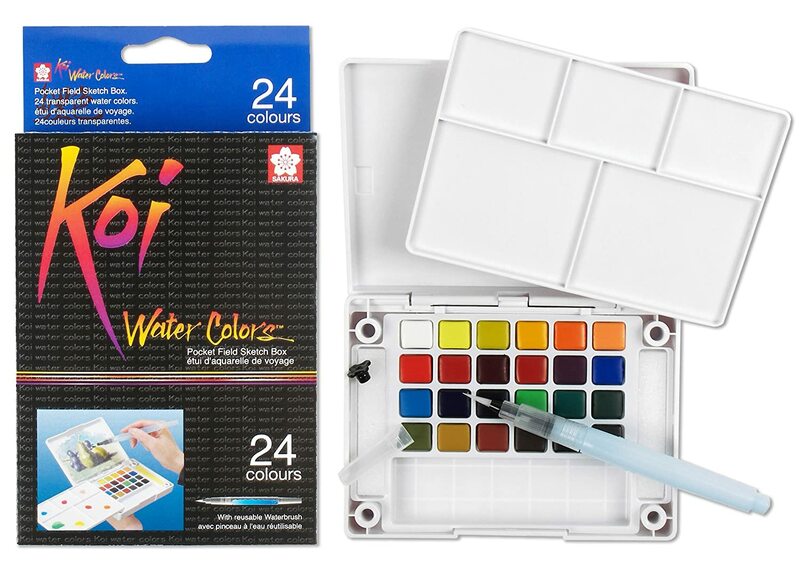 They’re absolutely genius, because they’re basically card stock filled with intense , highly concentrated & pigmented AF watercolors. All you’d need is a brush with a tiny bit of water and you’re good to go. Very ideal for travel on-the-go kits. Finding these online was a bit frustrating because not everyone sells them, and the main store takes no responsibility about international shipping. I did manage to find the small bonus pack on etsy and it was worth it. These were cut into tiny squares, but you can punch out circles, cut triangles or pretty much any shape you’d like. Make several pairs (swatch + watercolor) and bind them into a tiny portable watercolor book. Make several tiny card-sized palettes & place them inside a tin-card holder. I got one from Jarir Bookstore & it’s very pretty & super portable. Make a bigger palette, yo.